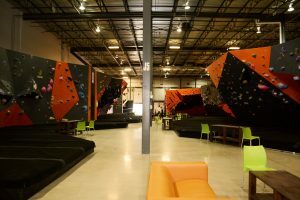 At its core, rock climbing involves climbing a route with one’s own hands and feet and little more than a cushioned mattress in the way of protection. This style of climbing is referred to as bouldering, since the relevant routes are usually found on boulders no more than 10 to 15 ft. tall. As routes get higher off the ground, the increased risk of injury necessitates additional safety measures. A variety of specialized climbing techniques and climbing equipment exists to provide that safety, and climbers will usually work in pairs and utilize a system of ropes and anchors designed to catch falls. Ropes and anchors can be configured differently to suit many styles of climbing, and roped climbing is thus divided into further sub-types that vary based on how their belay systems are set up. The different styles are described in more detail below, but, generally speaking, beginners will start with top roping and/or easy bouldering, and work their way up to lead climbing and beyond. 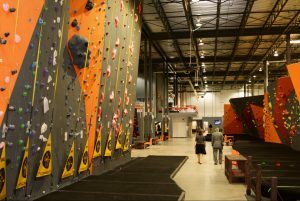 You have the chance to climb to more than 30 feet in height in complete safety with our auto-belays. All you have to do is attach the auto-belay to your harness and you climb. Once you reach the top of the wall, you let yourself go and the auto-belay will calmly lower you down to the ground. In addition, different route difficulties are available on the walls. Bouldering is climbing on short, low routes without the use of the safety rope that is typical of most other styles. Protection, if used at all, typically consists of a cushioned bouldering pad below the route and/or a spotter, a person that watches from below and directs the fall of the climber away from hazardous areas. Bouldering may be an arena for intense and relatively safe competition, resulting in exceptionally high difficulty standards. We invite you to read our regulations to climb safely.